Below, you can read WWE.com editors picks for who they think will walk out of the WrestleMania will their hand held high. BILL APTER: Passionate anger fueled by the weeks of methodically being physically taken apart by Lesnar have made Reigns’ focus to defeat Lesnar a "must win-must destroy" mission. No question in my mind that payback will indeed see a new Universal Champion crowned. ANTHONY BENIGNO: Wanting payback for a few years ago would be enough, but with Lesnar’s declaration that he’s out if Reigns becomes champ, The Big Dog has the chance to truly shift the balance of the Raw locker room. He won’t falter. RYAN PAPPOLLA: Go re-watch Brock Lesnar and Roman Reigns’ WrestleMania 31 battle, and you’ll gather everything you need to know about this rematch — shy of the miraculous, The Big Dog just can’t hang with The Beast. Give me Lesnar. KEVIN POWERS: The simple truth about The Beast Incarnate is that when it comes to big fights, especially on The Grandest Stage of Them All, he delivers, and he will remain Universal Champion. 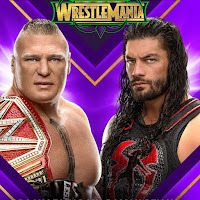 JON CHIK: Roman Reigns won’t be handcuffed, he won’t fall victim to a surprise cash-in from Seth Rollins, he’ll withstand The Beast’s onslaught just like he was doing the last time he fought Brock Lesnar in the main event of The Show of Shows, and he’ll finish the job just like he was about to do at WrestleMania 31. Reigns absorbs double-digit suplexes but finally puts Brock down with a quintet of bone-jarring Spears. APTER: A dream match come true, but Nakamura's dream of victory won't happen this time. I see a classic hold-for-hold, maneuver-for-maneuver match that will become a classic, but AJ will be a little bit better and just enough to retain the WWE Championship. BENIGNO: Could go either way, and the mind games have been great. This comes down to a gut feeling, and this particular viewer thinks it’s Nakamura’s time. PAPPOLLA: The winners here are the members of the WWE Universe for being able to experience the epic magnitude of this dream match. As for who will snag the victory? AJ is Phenomenal, but it’s time for The King of Strong Style to take his throne. POWERS: Headlining WrestleMania as WWE Champion is an enormous accomplishment and The Phenomenal One will seize the moment and utilize his experience to retain the WWE Championship. CHIK: Shinsuke Nakamura recently hypothesized that AJ Styles will lose at WrestleMania because he’s “too emotional,” but The Phenomenal One has worn his emotions on his sleeve for the greatest moments of his WWE career: When he twice defeated John Cena in 2016, when he became a two-time WWE Champion and when he stole the show in a victorious effort against Shane McMahon at last year’s WrestleMania. A main event clash for the WWE Title at The Show of Shows isn’t the time for tranquility, and a fired-up Styles will finally redeem himself for losing to Shinsuke in Japan more than two years ago (something he certainly hasn’t forgotten). APTER: I can't imagine that the WWE's executive duo don't have some sinister methods up their sleeves to insure victory, and the veteran Angle has been their victim before. We will see Ronda's temper and ring skills in top form during her official WWE ring debut, but that won't be enough to stop whatever Triple H & McMahon have planned. BENIGNO: Rousey may be new to the game, but she’s already made it clear she won’t be controlled. Add onto that Angle’s grudge with The Game, and look for a sterling debut from the UFC legend. PAPPOLLA: Ronda Rousey is the most dominant and important women’s athlete of all-time. Under no circumstances will she lose her first match in WWE. POWERS: Triple H and Stephanie McMahon are simply no match for two former Olympians in one of the biggest fights of their respective careers. CHIK: For weeks, Triple H and Stephanie McMahon have been quick to claim that WWE is “their world,” but Ronda Rousey has competed in combat sports all over the globe and is always quick to make it “her world,” as The Baddest Woman on the Planet will once again do on The Grandest Stage of Them All. Plus, Kurt Angle has spent his tenure as Raw GM being undermined by Triple H and Stephanie and even being forced to fight for his job at Survivor Series, so he’s undoubtedly chomping at the bit to finally pound his boss into submission. APTER: Daniel Bryan is making his comeback after three years. His ring skills have not been truly tested since he received clearance. Shane McMahon has a case of diverticulitis. Can he be at 100 percent? This team is not running on near full capacity. Plus, keep in mind they rarely see eye-to-eye on most matters. Owens and Zayn are a fine-oiled tag team machine. They win and get their jobs back. BENIGNO: Owens & Zayn will fight with a little extra urgency now that their re-hiring is on the table. But there’s no way Daniel Bryan is losing his homecoming. Welcome back. PAPPOLLA: Daniel Bryan’s comeback is one of the greatest stories in WWE history… but The “Yep!” Movement have brutalized him and Shane-O-Mac to intense degrees. Can I see them being healthy enough to pull it out? In a word, nope. POWERS: With their SmackDown LIVE careers on the line, Zayn and Owens will spoil Daniel Bryan’s in-ring return and remain part of the blue brand. CHIK: Even though Kevin Owens & Sami Zayn have aligned in recent months, we all know they’ll turn on each another at the drop of a hat. For all their differences, Shane McMahon & Daniel Bryan have never come to blows, and they’ll be united in getting sweet retribution against a duo that has put them through hell for months. Oh, and this is Bryan’s first match in three years, he’ll be virtually unstoppable, and KO & Zayn won’t know what hit them. APTER: Although she's one of the most confident competitors I have ever seen, Charlotte Flair has never faced an opponent as versatile as the "Amazing" Asuka. The star from the land of the "Rising Sun" is focused and ready to make Charlotte her prey and will defeat her in one of the Women's division's finest matches to ever take place. BENIGNO: Nobody is ready. Not even Charlotte. Sorry Queen. PAPPOLLA: Empress outranks Queen for a reason. Sometimes, it’s just that simple. POWERS: The Empress of Tomorrow has defeated every competitor that has dared to face her; Charlotte Flair will be no different. CHIK: Is it possible that Charlotte Flair turns in the greatest performance of her already remarkable career, dazzles the WWE Universe with yet another show-stealing championship bout and struts back up the ramp with her SmackDown Women’s Title at The Show of Shows? Yes, it’s possible. But how could anyone bet against an undefeated challenger that has already run roughshod over the entire Raw Women’s division? Asuka continues her unprecedented reign of dominance with championship gold. APTER: Alexa Bliss is a fox -- and a sly one at that. With a weight disadvantage of about 140 pounds, Bliss has to be super-fast and avoid being captured by Jax, who uses her frame to squash opponents. Bliss will outthink Nia, whose anger will cause her to make a tactical mistake that lets Bliss move on and take the win. BENIGNO: Nasty and short — all descriptors for Alexa Bliss, true. But this match is looking more and more like a rout in the favor of the proud, motivated Jax following her former friend’s bone-deep insults. PAPPOLLA: Alexa Bliss may not have wanted Nia Jax to hear, but the fact of the matter is this — she is better than Nia Jax. She’s better than most everybody. Bow down to The Goddess. POWERS: Despite their former friendship, Nia Jax is going to teach Alexa Bliss a lesson in pain, punishment and defeat. CHIK: The Wicked Witch of WWE might have stood a fighting chance had she remained buddies with Nia Jax and simply granted her a well-deserved, one-on-one title match, but by heartlessly antagonizing Nia and denouncing their friendship in recent weeks, Alexa has sealed her own fate and will soon get her comeuppance from a highly motivated Irresistible Force. APTER: Three teams all unique. The Bludgeon Brothers just want to hurt people -- that's their focus -- not titles. New Day is all about the fun -- the show. The Usos are strictly focused on business and the egos to boast they are the champions. Somehow through the wildness that will ensue, the Samoan duo will keep the gold once again. BENIGNO: The Usos finally make it to WrestleMania, and The New Day look to lose their goose egg at The Show of Shows. But it’s The Bludgeon Brothers, who have long been boiling under the surface, who will finally seize their moment. PAPPOLLA: Everything we’ve seen points to The Bludgeon Brothers running amuck en route to the SmackDown Tag Team Titles… but with no mallets (in theory) and the potential for The New Day and The Usos to team up, I don’t like their chances. Nah, instead, Jimmy & Jey finally get their WrestleMania moment. POWERS: The history and animosity between The New Day and The Usos may work against them, keeping the focus on each other, allowing The Bludgeon Brothers to claim a huge victory. CHIK: What exactly were Harper and Rowan up to during their time away from the SmackDown LIVE locker room? No matter. The mallet-wielding maniacs regrouped and returned to Team Blue with an even more sinister mindset, laser-beam focus and an appetite for destruction. The bludgeonings continue at The Show of Shows in the form of new SmackDown Tag Team Champions. APTER: I have never seen Seth Rollins as good as he is these past few months. His attitude, his skills in the ring are at an all-time peak. The support of the fans is at an all-time peak. It's his time to rule the Intercontinental roost. Rollins kicks Miz and Bálor to the curb for a truly impressive win. PAPPOLLA: First off, keep an eye on this one to steal the show. Secondly, keep an eye on Seth Rollins… as he might burn the freaking place down! POWERS: Having one of the best weeks of his life, the Intercontinental Champion just had his first child and won the Mixed Match Challenge, and he’ll ride that wave of momentum to victory. CHIK: When an already exceptional athlete is deeply inspired by something in his or her personal or professional life, the results often become the stuff of legend. Given that The Miz just witnessed the birth of his first child (personal life) and is closing in on becoming the longest-reigning Intercontinental Champion of all time (professional life), it’s the perfect storm for The A-Lister to deliver a performance for the ages. APTER: Make no mistake about what a brutal match this will be, but The Bulgarian Brute has never been so mentally and physically prepared as he is for this match. This will indeed by the Rusev Day he has been waiting for! PAPPOLLA: Four of SmackDown LIVE’s best will square off with the United States Championship on the line… but only one of them has actually won on The Grandest Stage of Them All before. POWERS: WrestleMania falls on Rusev Day! CHIK: Multi-man matches can be decided at the drop of a hat, so the advantage goes to the Superstar with the ability to land a lightning-quick strike. While the Glorious DDT, the Khallas and the Accolade are all deadly weapons of choice, each takes significantly longer to set up than a ring-rattling RKO outta nowhere, which, as we’ve seen, can be delivered from any position. The Viper retains. APTER: No matter who Braun picks as his partner, he'll still be in the ring most of the time to prove he's a modern-day One Man Gang. His partner won't break a sweat and will reap the accolades of a titleholder when Strowman almost single-handedly becomes the tag team champion(s)! BENIGNO: Strowman can beat up anybody on his own, but winning the tag team titles takes two. And as fun as it will be to watch him throw The Bar around, the champs have one thing right: No impromptu partnership is going to beat a true-blue team. The Bar retains, and Strowman smashes. PAPPOLLA: Perhaps it is silly to bet on Braun Strowman before we even know who his partner is. Or, perhaps it is sillier to bet against Braun Strowman in any situation ever. I lean toward the latter. POWERS: Braun Strowman may be the Monster Among Men, but when it comes to tag team competition, chemistry is what counts, and Sheamus & Cesaro are The Bar. CHIK: While many of us are preoccupied with who will team with Braun Strowman, let us not forget that Sheamus and Cesaro have ruled the Tag Team division with an iron fist over the past year-plus, capturing the gold four times. Strowman admittedly doesn’t play well with others, and The Celtic Warrior and Swiss Cyborg will expose that truth in their most grueling title defense yet. APTER: Given the field of competitors at press time, I see Hardy deleting everyone he comes in contact with to become the most unique character to win this yearly classic event. BENIGNO: Anybody’s ballgame, but barring a surprise entrant that throws the melee into question, it’s hard to bet against a guy who just wiped a man off the face of the earth. PAPPOLLA: Tye Dillinger was never technically eliminated from this year’s Royal Rumble. Thus, he is the favorite here. That’s simple math, which adds up to 10. POWERS: “Woken” Matt Hardy is completely unpredictable, and the seven deities have provided a pree-mo-neetion that says the competition will be deleted! CHIK: Baron Corbin has already shown that he thrives in the chaos of a multi-man match, winning the Andre the Giant Memorial Battle Royal in his main roster debut at WrestleMania 32 and capturing the Money in the Bank Ladder Match in 2017. Additionally, The Lone Wolf cleaned house and claimed the pin in a wild Eight-Man Tag Team Match on the most recent SmackDown LIVE, and he’ll once again dominate the pack to become the first two-time winner of the annual extravaganza. APTER: It won't come easy, but in the end Sasha will stand proudly as the last standing woman who makes it into the history books as the winner of this first-time-ever WrestleMania event. BENIGNO: The story thus far has been Bayley and Sasha Banks finally coming to blows… which means there’s just enough of an opening for another horsewoman to swoop in and remind everyone just how good she is. PAPPOLLA: The first-ever WrestleMania Women’s Battle Royal is a fantastic landmark in the Women’s Evolution, and it’s winner will be F-A-B-U-L-O-U-S. Bank on it. POWERS: Not only does WrestleMania fall on Rusev Day, but Lana may be underestimated heading into the battle royal and could pull off a shocking victory. Lana is the best! Lana number one! CHIK: With a name like Ruby Riott, it’s safe to say that the punk-rock pugilist will be right at home in the mosh pit of a match that is the WrestleMania Women’s Battle Royal. With some help from her Riott Squad cohorts, Ruby notches the most eliminations and emerges as the last woman standing. APTER: Both competitors are so hungry to win this title. I love the Cruiserweight division, as the matches are so energetic, high-flying and unforgettable. Cedric takes this by a very narrow margin, as they are so equally matched. BENIGNO: Under-the-radar pick for match of the night? Yep. A rare case for the WWE Universe winning no matter who hoists the title as these two unique athletes go head-to-head. But if we have to pick, the choice is Cedric, who completes the path to the top that first presented itself at the Cruiserweight Classic. PAPPOLLA: Mustafa Ali is the heart of 205 Live, Cedric Alexander is the soul. By simple deduction you arrive at the winner of this Cruiserweight Title contest – eventually, all hearts give out. The soul is forever. Welcome to the #AgeOfAlexander. POWERS: This is Alexander’s moment, he’s waited for too long to finally have his chance to compete for the WWE Cruiserweight Champion and nothing will stand in the way of victory, not even his friend. CHIK: Real talk: We’re all winners in this one. Cedric Alexander and Mustafa Ali got to WrestleMania by navigating through a thrilling 16-man tournament that’s seen a fun bunch of barnburners, and the two close friends are certain to once again dazzle the masses as they soar through the New Orleans skies in their title bout. Two of 205 Live’s best leave the WWE Universe awe-struck after a show-stealer, and Ali edges Alexander with the death-defying 054.